His kingdom is not of this world and His ways are above our ways. This is so important to remember if we plan on having any peace in our lives. Jesus’ Kingdom is one where the King leaves His throne and serves his people, suffers and gives His life for them. It’s a Kingdom where all people are welcome at His table, rich or poor, liberal or conservative, citizen or foreigner. Jesus simply does things differently. Let us not be surprised, then, when He does things differently than we would do them. Let us not be discouraged, then, when our plans aren’t coming to fruition. While we’re often focused on our Earthly ease, He’s focused on our Heavenly inheritance. He has our best in mind, and His ways are high above ours. We don’t always understand Him, but that doesn't mean we can’t trust Him. As I write this from a hillside in England, standing before what remains of an 11th century castle, I’m reminded that what we build by ourselves, for ourselves, will fade. This castle must have looked impenetrable back then. Now, thanks to some well-aimed canon balls, it’s mostly reduced to rubble. However, what we let the Lord build in us will sustain to the very end, will never crumble, will be a fortress for the weak, will be a place of lasting joy and celebration. Sure, we’ll take some blows, but the world can’t destroy what the Lord is building. His Kingdom is not of this world. It’s too late for me. I’ve spent too long building my own kingdom. It hasn’t worked, and it’s too late to start over. I’ve made a mess of things, and it’s past the point of redemption. My friends, the Lord will use whatever broken pieces we give to Him to make beautiful things. The walls of that castle are now the perfect backdrop for the outdoor Mass we’re about to celebrate. It’s got little statues placed on it’s platforms, and blue ribbons strung across it’s entryway. Hardly what the builder imagined his mighty fortress would look like one day. However, I’d argue these walls have never been so beautiful, have never been the site of such peace and safety, and have never hosted such a magnificent banquet as the one they’re hosting today. When we open our eyes to His goodness, we get a glimpse at the blueprints. Whatever we’re making, He’s building something better. 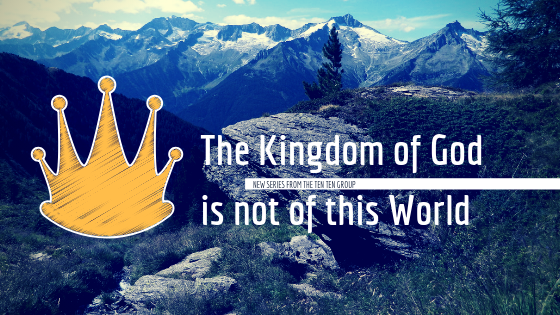 His Kingdom is not of this world.